There's a special Brecon Jazz edition of the Jazz Connection this coming Monday 2 August 2010 at 8pm on Radio Cardiff 98.7 FM. As in previous years, I'll be playing tracks from some of the big international names, UK stars and local heroes due to play the Brecon Jazz and Brecon Fringe festivals in the mid Wales market town from Friday 6 to Sunday 8 August. As far as I know, no other radio station in the UK is doing any preview programme about the festival - if I'm wrong, please correct me and I'll post the details here. Next week's show - Monday 2 August - will be a preview of the Brecon Jazz and Brecon Fringe festivals with tracks by as many of the weekend's attractions as I can fit in. Members of the Adamant band are upset at a decision to leave them out of the street parade at this year's Brecon Jazz Festival on Sunday 8 August for the first time in the event's 26 year history. Festival director Peter Florence is quoted in the Brecon & Radnor Express as saying: "They've played a lot of parades and are playing the Cathedral Service but I'm sure it's time for a change." "If you do the same thing every year then Brecon ends up exactly the same and that's not always a good thing." Mr Florence is also quoted as saying: "I think it's time for burning sacred cows to be honest and I really want to do something more interesting with better musicians." 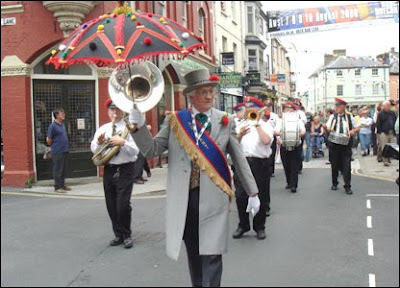 Responding to the article, Adamant parade marshal Jim Wood said he was amazed at Mr Florence's comments, pointing out that "he was more than delighted to use these 'sub standard' musicians in his successful bid for funding" from the Arts Council of Wales. Chris Hodgkins, director of Jazz Services UK, added: "Brecon Jazz Festival is in receipt of circa £100,000 of Welsh taxpayer's money and it will probably come as a surprise to Mr Florence of Hay-on-Wye that those musicians who he has so rudely eschewed are also the same people who pay taxes." He added: "This year's festival is notable for the lack of Welsh jazz musicians playing, apart from a student ensemble, who I hope will be properly remunerated for their work." See the Brecon & Radnor Express website for more about this story. *** UPDATE - the Adamant Band has now been offered an additional gig by the Castle Hotel, one of the Brecon Fringe venues. The long running Jazz Attic jam sessions at Cafe Jazz in Cardiff will be moving from Mondays to Wednesday nights starting in August. There'll be sessions on August 25 and September 15 before continuing on the second and fourth Wednesdays of every month from October onwards. The jam sessions offer guest musicians the chance to play with a house trio featuring leading figures from the south Wales jazz scene. Admission is still only £2 - see www.jazzwales.org.uk for updates. There's no word on whether Cafe Jazz is planning to offer any alternative entertainment on Monday nights. Blues Central – Why Did You Do It?